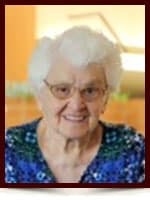 Jeanne D'arc Girard - Edmonton's Burial & Cremation Professionals | Trinity Funeral Home Ltd.
We are deeply saddened by the passing of our beloved mother on September 28, 2015 at the age of 99 years in Edmonton, Alberta. She is survived by her children; Robert(Trudie), Paul(Jeanette), Yvonne(Richard), Carmen(Jacques), Denise(Boyd), numerous grandchildren, great grandchildren and great great grandchildren, sisters Marie Aline Parent of Edmonton and Candide Anctil of Falher. She was predeceased by her husband, Eugene, son Gilbert, her sister Claircy and her brother Alonzo. Or to the charity of one’s choice. Our deepest sympathy to the family. Our thoughts and prayers are with you . Our condolences to Denise and her family on the loss of her mother. Sending hugs across the miles xo. Mitch, Sarah, Kyle and Sabrina. Our thoughts and prayers are with you Denise. Your Mum was blessed to have you for a daughter. Our deepest sympathies to you Denise and Boyd and to your family. It is always hard to lose a mother, even one who has lived such a long and full life. We are thinking of you. Love from Rick and Heather.